Swimming with dolphins in Florida is an experience that’s on a lot of people’s bucket lists, and anyone who’s been to the sunshine state knows the best place to do it is at Discovery Cove! Voted on TripAdvisor as the “Best Amusement Park in the World”, Discovery Cove gives you the opportunity to interact with these gentle animals up-close in a once-in-a-lifetime dolphin swim. So what happens at a Discovery Cove dolphin swim? You’ll be allocated your dolphin swim time when you first arrive, so you’ll want to get there nice and early! Firstly, make sure you’re at the dolphin lagoon in plenty of time for your swim – they won’t wait for any stragglers. Along with your small group, you’ll watch a short introduction to dolphins, their behaviour and the wonderful ways they communicate. Then it’s time to wade into the waist-deep lagoon and meet your dolphin! The dolphin trainer will introduce you to your new dolphin friend for some fun and games – and of course lots of treats! This is when you get to see how intelligent dolphins really are! Everyone in the group will get some interaction, like kisses, hugs and belly rubs, and the dolphin will show off his or her favourite tricks. Then each of you will take turns heading out into the deeper water to be gently towed back to shore by your dolphin! Dolphin swims take about 30 minutes in total, so you’ll have plenty of time to enjoy the rest of Discovery Cove throughout the day. I’m not a good swimmer – can I still participate? If you’re not confident in deeper water, you can have your dolphin swim in a shallower area of the lagoon. What if some of us don’t want to swim with the dolphins? Not a problem! Just choose SWIM tickets for those who want to do the swim, and NON-SWIM tickets for those who don’t – they’ll be welcome to sit on the beach and watch. 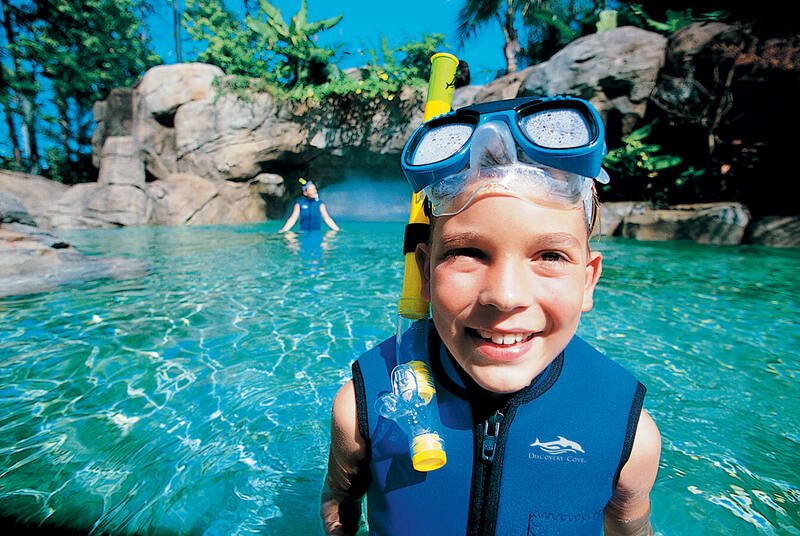 Even if you decide not to swim with dolphins, there are still plenty of other things to see and do at Discovery Cove. Feed the birds at the Explorer’s Aviary, go snorkelling with some amazing tropical fish and huge rays at the Grand Reef, or just catch some sun on the gorgeous beaches! If you’re going to Discovery Cove, don’t forget….. Many Discovery Cove tickets also give you admission to SeaWorld and Aquatica (plus Busch Gardens with the ultimate ticket!). So if you want to visit those parks, you won’t need to buy separate tickets.